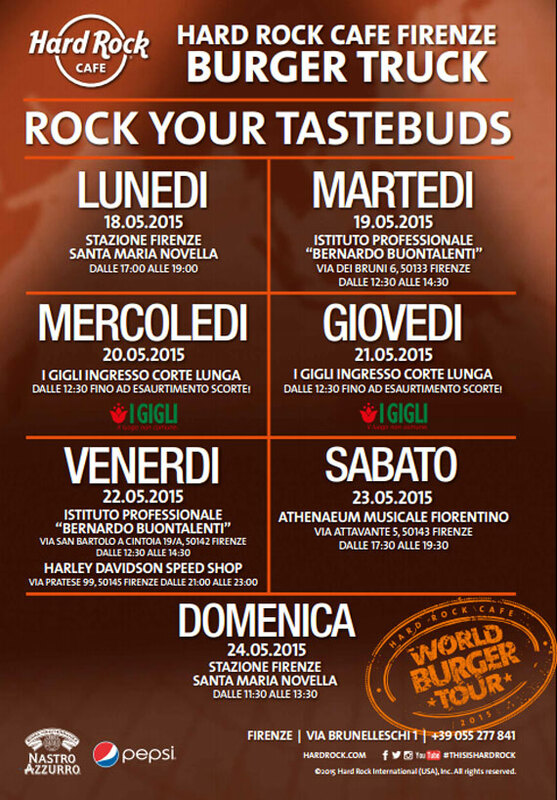 Blog / Events / The World Burger Tour is coming to Florence! The World Burger Tour is coming to Florence! If you’re getting hungry and want a break from Tuscan cuisine, then search out Hard Rock Cafe‘s “street truck” next week for free tastings of the diner’s classics as part of the World Burger Tour! From the Hard Rock Burger, Hard Rock Cheese Burger and Hard Rock Bacon Cheese Burger to the Legendary Burger and Tupelo and Fries… all will be prepared on the spot as street food, giving you a chance to enjoy freshly-made, street food sized burgers accompanied by a Pepsi or Nastro Azzurro (sponsors of the tour) and classic rock music, as is the Hard Rock Cafe style. You’ll also get the chance to participate in social contests to win great prizes, including one-of-a-kind Hard Rock Cafe gadgets. 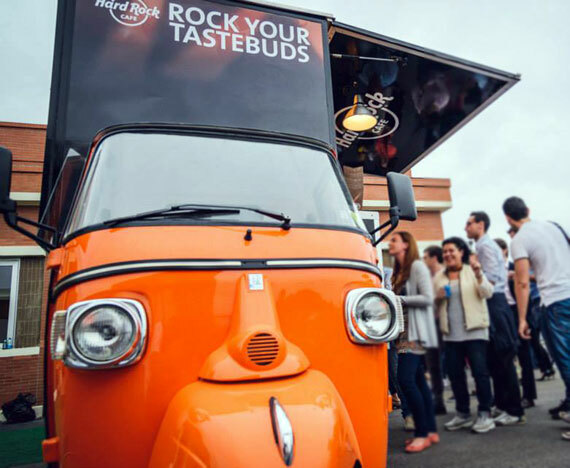 The World Burger Tour by Hard Rock Cafe International arrives in Florence with an “Ape” Piaggio Classic Rock, the classic Italian 3-wheeled mini truck dressed up as a food truck, and to locations across town from May 18th through the 24th. Arriving in Florence after a successful stop in Rome, the Ape Piaggio Classic Rock is crossing Italy offering everyone a taste of classic Hard Rock dishes. The international journey this May is making its way across Europe and Italy. After Munich and Berlin, the truck arrived in Rome and will be arriving to Florence next before moving on to Venice and then on to Bruxelles, Copenhagen, Edinburg, Madrid and Prague. Saturday, May 23 from 5.30 to 7:30pm at the Athenaeum Musicale Fiorentino on via Attavante 5. Follow updates on the World Burger Tour in Florence on Facebook: https://www.facebook.com/events/829113817182884/ and if you love the Hard Rock Cafe in Florence, make sure to follow their Facebook page for details on live music concerts, special Happy Hour deals and upcoming events!